I filmed a video and it was one big blooper! So I did another and I didn't like it any better than the first. So, to save time, I'm posting the tutorial(s) instead. If you would like to Print or Save a PDF copy, click on the PRINT button at the very bottom, left side of this post. Paper: 5" x 12" Daffodil Delight CS (124275),5 strips 3/8" x 12" Basic Black Card Stock (124267) & Whisper White(100730) Pink Pirouette CS (111351). Ribbon - 5/8" Basic Black Satin Ribbon (117285); 2 pieces 7" each and 1/8" Daffodil Delight Taffeta Ribbon (119254). Adhere 5 - 3/8" x 12" strips of Basic Black CS to 5" x 12" Daffodil Delight CS using SNAIL and spacing 1" apart. Place on Fancy Favor die and cut out using Big Shot. Fold on score lines and assemble using Sticky Strip. To attach the handles: 2 pieces of ribbon, approx. 7" ea. Place a small piece on Stick Strip, on the inside ( right & left side) of the front & back panels. Remove red backing and adhere ribbon for front & back handle. 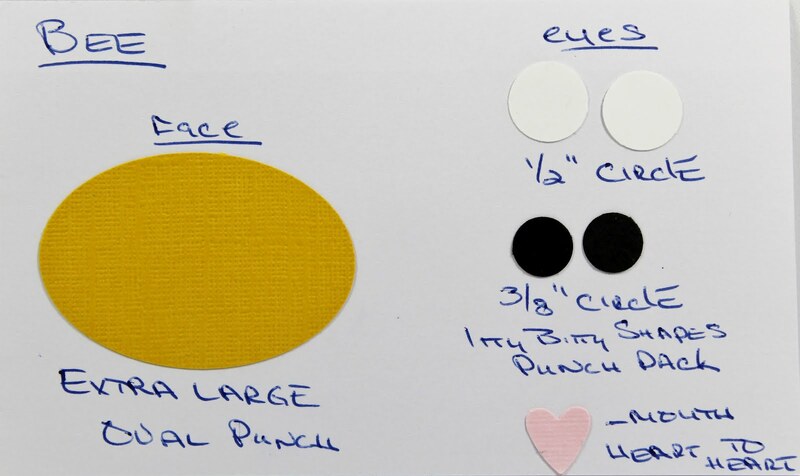 Face: punch extra large oval in Daffodil Delight CS. Eyes: attach 2 - 3/8" circles in Basic Black to 1/2" circles in Whisper White CS. Use white gel pen and make a dot off-center for each eye. Attach to face with mini glue dots. Make two dots for nose using Basic Black Stampin Write Marker and then draw mouth. Punch lips in Pink Pirouette CS using the smallest heart from the Heart to Heart punch. Attach with mini glue dot. Antennas: I wrapped 2 - 2" pieces of craft wire around paper piercer to curl and attached to the back of the large oval using pop-up glue dot. 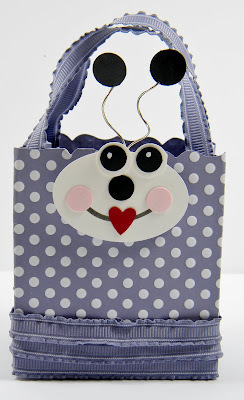 Attach face to bag with a Stampin' Dimensional. Tie a small bow in 1/8" Daffodil Delight Taffeta Ribbon and attach to bottom of face with mini glue dot. Thread a small piece of 1/8" Daffodil Delight Taffeta Ribbon thru each Basic Black button, trim ends and attach to bag with mini glue dots. Paper: Soft Suede Card Stock, 5" x 12" (124298) Not Quite Navy Card Stock 3" x 12" (124283), Basic Black Card Stock (121045) & Whisper White(100730). Ribbon - the ribbon I used in now retired, but you could substitute 3/8" Not Quite Navy Taffeta Ribbon (122978) 2 pieces 7" each and 1 - 10-3/8" piece. Adhere 3" x 12" Not Quite Navy CS to Soft Suede CS 5" x 12" using SNAIL or double sided adhesive. Belt loops: Cut 2 pieces 3/8" wide of Night of Navy CS and wrap around 10-3/8" piece of ribbon and adhere with SNAIL or double sided adhesive and trim excess. Apply Sticky Strip on backside of ribbon and attach over the seam of where the Night of Navy CS and Soft Suede CS meet. Head & Face: Punch 1 piece of Whisper White CS and 1 Soft Suede using the Extra Large Oval punch. Face: I punched out a triangle using the Petite Pennants Builder Punch in Whisper White CS and attached to Soft Suede Oval. Adhere two ovals together. 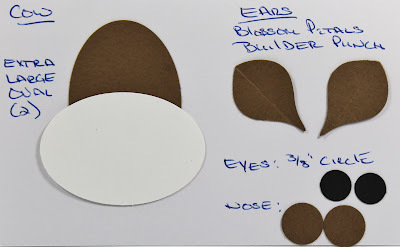 Ears: Using the Blossom Petals Builder punch , punch out two (2nd to the smallest) petals in Soft Suede. Lay them onto Mat Pack and take bone folder and make a crease down the center of each ear. Attach on the back side on the head with SNAIL or mini glue dots. Hair: I took a scrap piece of ribbon and made a couple snips and attached with SNAIL. Eyes: 2 - 3/8" circles in Basic Black and use white gel pen and make a dot off-center. Attach to face with mini glue dots. Nose: 2 - 1/2" circles in Soft Suede and attach with mini glue dots. Mouth: Draw mouth using Soft Suede Stampin Write marker. Place Stampin' Dimensional to the back and attach to gift bag. Ribbon - 3/8" Wisteria Wonder Ruffled Ribbon; 2 pieces 7" each and 3 - 10-3/8" piece. Place 5" x 12" DSP on Fancy Favor die and cut out using Big Shot. Skirt: apply Sticky Strip on on each piece of 10-3/8" ribbon. Attach to bag starting at the bottom with the first piece and then overlapping the 2nd & 3rd. Head & Face: Punch 1 piece of Whisper White CS using the Extra Large Oval punch. Antennas: I wrapped 2 - 2-1/2" pieces of craft wire around paper piercer to curl and attached to the back of the large oval using pop-up glue dot. Take 4 - 1/2" circles in Basic Black and attach to the end, front and back, of antenna with mini glue dots. Eyes: attach 2 - 3/8" circles in Basic Black to 2 - 1/2" circles in Whisper white and using white gel pen make a dot off-center on each eye. Attach to face with mini glue dot. 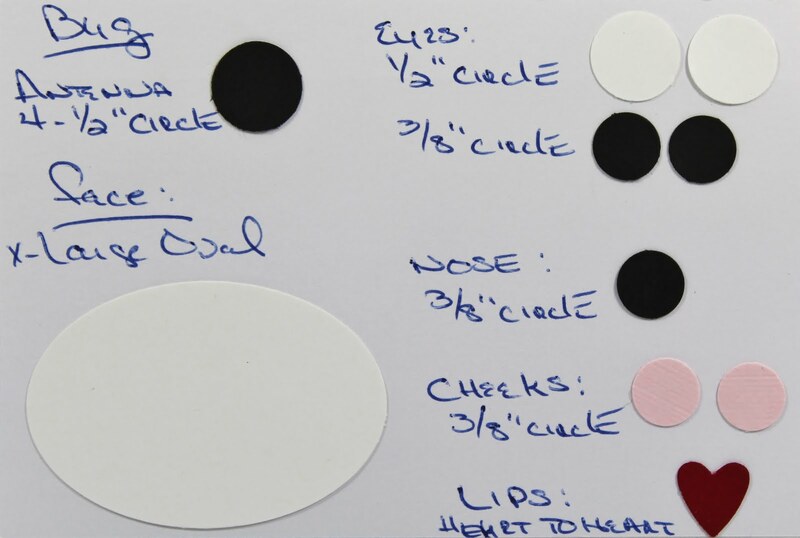 Nose: attach 3/8" circle in Basic Black with mini glue dot. Draw mouth using Basic Black Stampin Write Marker and attach two Pink Pirouette 3/8" circles with mini glue dots for cheeks. Lips: using the smallest heart on the Heart to Heart punch a heart in Cherry Cobbler CS and attach to mouth with mini glue dot. 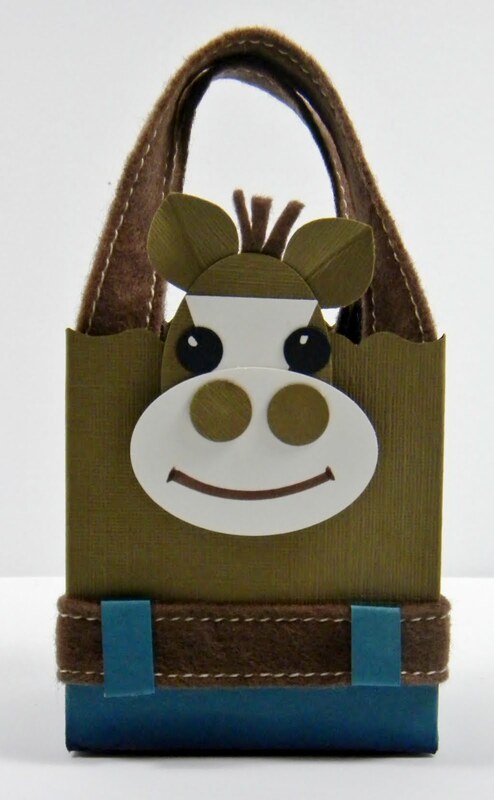 Attach face to bag with Stampin' Dimensional. These are all wonderful! Thank you for sharing the great tutorials! Wishing you a happy day today with the extra 24 in February! How cool are these punch art gift bags. Thank you so mcuh for sharing. I found your blog from Kim Score's blog. LOVE these cute little guys. great tute. They are too cute for words! I love the little cow. thank you for sharing it!!! it's wonderfull!!! I'll do this with my son for his birthday!!! 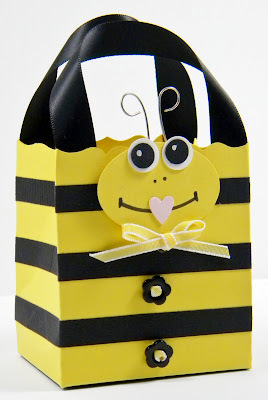 Every year, for my kids birthday, I make with them little boxes with candy for their classroom... This year, it will be an original candy bag!!! thank you so much!! These all are wonderful, thanks for sharing.